A number of studies have been carried out all over the world to enumerate and evaluate the health effects of cotton dust exposed workers in different processes. However, such studies carried out in ginning industry especially in Indian context are scanty. Hence this study was initiated to explore occupational and morbidity details and respiratory functional status of the exposed workers as well as to investigate across the working shift pulmonary function changes. This cross-sectional epidemiological study was conducted on workers from three ginning units where principal exposure is from cotton dust. A gin is the place where harvested cotton is taken to a series of process and lint is separated from the seed. Transported cotton is stored in open air. Cotton is fed into the process by automatic/semi-automatic feeding. The actual process of ginning takes place in gin house where a series of ginning machines and a long conveyer is installed. Ginned cotton is transported through one or more gin-lint cleaners to the press house where it is pressed into bales through a semi-automatic procedure. Ultimately, the produced cotton and the seed are both marketed. All the workers of the selected ginning units were included in this study. Initially the aim of the study was explained to the workers, and informed consent was obtained after which they were enrolled for this study. The study received ethical clearance from the institutional ethics committee. The participants of this study were subjected to an interview with a predesigned questionnaire to collect occupational and medical history, clinical examination and pulmonary function test. FVC and PEFR were recorded by Spirovit-sp-10 (Schiller Health Care Ltd, Switzerland) and Wright's peak flow meter. First, the procedure was shown and explained to the subjects. They were made comfortable with repeated training. Then only the observations were recorded. While recording observations, three recordings were taken in standing posture using nose clip and the best value was taken for analysis. Different flow volumes like FEV 1 and FEV 1 % were calculated from the same tracings. All volumes obtained were expressed in body temperature on atmospheric pressure of air saturated with water vapor (BTPS). Body height and body weight were measured in bare feet on a standard scale. Pulmonary function test values were predicted from the standard prediction equation. The standard prediction equation of Udwadia et al. was used. This equation is based on western India population and our present study was also conducted in western India. Hence, this equation was used. The instrument was calibrated every day before starting the experiment. For categorizing pulmonary function impairment, 80% of predicted value of FVC and FEV 1 /FVC ratio of 0.7 was considered as cut-off marks for determining restrictive and obstructive impairment. One hundred and sixty-eight subjects participated in this study; however, pulmonary function test could be performed in 154 subjects. Subjects with established diagnosed respiratory disease, subjects in prolonged medication, subjects with chest injury/operation, and subjects with simultaneous other industrial/occupational exposure (ginning job being seasonal) were excluded for pulmonary function study. Pulmonary function test was carried out by experienced technical staffs of National Institute of Occupational Health, Ahmedabad, India. Twelve subjects had other industrial/occupational exposures and 2 subjects did not cooperate for this examination. So, these 14 subjects could not be included in the pulmonary function study. Analysis of the collected data showed that mean age of the workers was 31.5 ± 11.2 years, mean job duration was 6.8 ± 4.8 years, majority (47%) was of 26-45 years of age and 10% subjects had work experience of 15 years or more. Among the study subjects, 59% were actual workers, 15% were supervisory staffs, and 26% were allied workers. Out of the actual workers, 37% were in gin house, 34% in press, 4% in bagging, and 10% in cotton loading and unloading. Around 8% were fitters and remaining 7% were engaged in clearing cotton after ginning. Mean family size of the workers was 3.9 ± 2.1. Twenty-five percent of them were illiterate. Mean body height and body weight were 167.6 ± 8.2 cm and 60.2 ± 14.5 kg, respectively [Table 1]. Common health problems among these subjects working in different activities of ginning were backache (20%), joint pain (12%), headache (4%), recurrent cough (4%), etc., About 2.5% workers were suffering from asthma. 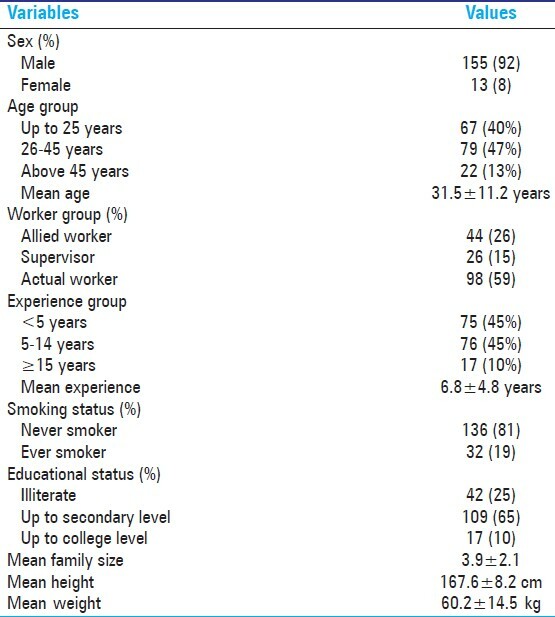 Irritation of nose (2%) and eye (2.5%) as well as chest tightness (1.5%) was experienced by some workers. As far as pulmonary function is concerned, it was observed that all the relevant parameters showed a declining trend with increasing experience of job. Similar trend was observed in majority of parameters with increasing age of the study subjects and smoking status. 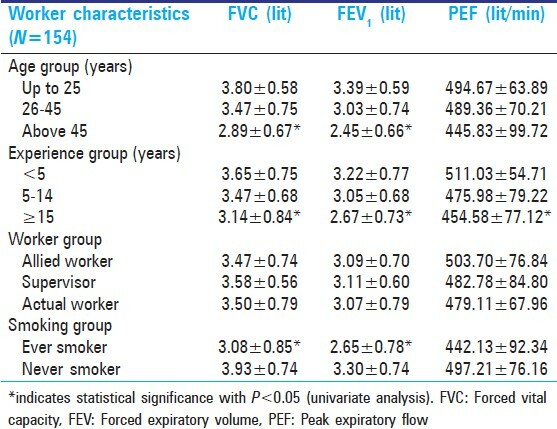 However, no significant difference of pulmonary function parameters was observed when compared between actual workers, supervisory staffs, and allied workers (univariate analysis) [Table 2]. On multivariate analysis when adjustment for age and height was taken up, it was observed that job experience had no significant effect although age and height showed significant effects. However, in case of smoking, it was observed that smokers had significantly lower values of FVC, FEV 1 , and PEF after adjustment for age and height. Across the working shift, changes in pulmonary function was also examined in some workers. In general, no such significant across-the-shift deterioration of values was observed [Table 3]. Out of 154 workers examined for pulmonary function test, four subjects had obstructive abnormality and nine workers had restrictive abnormality. Circadian rhythm of PEFR values (three times/day) of 22 healthy volunteers was obtained for consecutive two days after initiation of exposure to cotton dust (first two working days of the week). One-way ANOVA with post hoc test (Tukey HSD) was applied on the obtained data, which showed no significant difference at any level [Table 4]. Occupational factors contribute to a significant fraction of respiratory disease and symptoms. The role of occupational exposures in asthma, chronic bronchitis, and respiratory symptoms is already explored. Moreover, non-specific respiratory symptoms in isolation or in combination with respiratory functional impairments with or without symptoms may also be related to such exposures. Cotton dust exposure produces a unique condition named byssinosis that produces symptoms like chest tightness mostly on resuming work after an absence, altered pulmonary functions findings, etc., Circadian rhythms in peak expiratory flow rate following cotton dust exposure showed interesting new findings. Common health problems among the subjects in this study were backache, joint pain, headache, recurrent cough etc., A few workers were suffering from asthma. Nose and eye irritation as well as chest tightness was experienced by some workers. Workers with consistent symptomatic findings of byssinosis were not observed. So far as pulmonary function is concerned, it was observed that all the relevant parameters showed a declining trend with increasing experience of job. Similar trend was observed in majority of parameters with increasing age of the study subjects and smoking status (univariate analysis). On multivariate analysis smokers had significantly lower PFT values after adjustment for age and height although job experience had no significant effect. In general no such significant across the shift deterioration of values was observed. Distribution of PEFR data obtained at regular intervals on first two working days of the week showed no significant difference at any level. Studies on cotton textile workers have also shown cross shift and chronic decline of FEV 1 values. , However, such studies carried out in ginning industry particularly in India are scanty. , In this present study, no cross-shift significant changes in relation to PEFR and FEV 1 values is observed. However, chronic effect on lung function is observed in a few subjects and declining trend of values was observed with increasing job duration. A study conducted in Turkey on cottonseed workers came out with similar findings like our study and concluded that smoking appears to be the main factor responsible for respiratory symptoms among such workers. This difference of observation in case of ginning activities compared to other cotton dust exposures may be explained by non-continuous and seasonal nature of exposure in case of ginning. The activity of ginning is undertaken in a seasonal manner for a period of 3-4 months only in a year and the activity is not continuous and interrupted by different factors. Exposure from other sources and confounding effect of age might also have contributed in the findings observed in the study subjects. Special emphasis should be given in such workplaces to protection of respiratory health. Periodic relevant examination (clinical examination and lung function test) and industrial hygiene survey (periodic monitoring of dust and toxicants like gram-negative bacteria, endotoxins) at regular intervals is recommended. Prevalence of backache and joint pain during work in a good number of workers reflects that manual work of the industry might be causing some discomfort for the workers. Training on proper method of manual material handling may also prove useful for these workers. Khan AJ, Nanchal R. Cotton dust lung diseases. Curr Opin Pulm Med 2007;13:137-41. LeVan TD, Koh WP, Lee HP, Koh D, Yu MC, London SJ. Vapor, dust, and smoke exposure in relation to adult-onset asthma and chronic respiratory symptoms: The Singapore Chinese Health Study. Am J Epidemiol 2006;163:1118-28. Wang XR, Eisen EA, Zhang HX, Sun BX, Dai HL, Pan LD, et al. Respiratory symptoms and cotton dust exposure; Results of a 15 year follow up observation. Occup Environ Med 2003;60:935-41. Wang XR, Pan LD, Zhang HX, Sun BX, Dai HL, Christiani DC. Lung function, airway reactivity, and atopy in newly hired female cotton textile workers. Arch Environ Health 2003;58:6-13. Cinkotai FF, Sharpe TC, Gibbs AC. Circadian rhythms in peak expiratory flow rate in workers exposed to cotton dust. Thorax 1984;39:759-65. Doctor PB, Bhagia LJ, Derasari AY, Vyas JB, Amin RJ, Ghosh SK. A preliminary study on gram-negative bacteria (GNB) and their endotoxins in a gin house in India. J Occup Environ Hyg 2006;3:707-12. Udwadia FE, Sunavala JD, Shetye VM. Lung function studies in healthy Indian subjects. J Assoc Physicians India 1987;35:491-6. Pellegrino R, Viegi G, Brusasco V, Crapo RO, Burgos F, Casaburi R, et al. Interpretative strategies for lung function tests. Eur Respir J 2005;26:948-68. Wang X, Zhang HX, Sun BX, Dai HL, Hang JQ, Eisen E, et al. Cross-shift airway responses and long-term decline in FEV1 in cotton textile workers. Am J Respir Crit Care Med 2008;177:316-20. Bakirci N, Kalaca S, Francis H, Fletcher AM, Pickering CA, Tumerdem N, et al. Natural history and risk factors of early respiratory responses to exposure to cotton dust in newly exposed workers. J Occup Environ Med 2007;49:853-61. Rylander R, Jacobs RR. Organic Dust Exposure, Effects and Prevention. 2 nd ed., Vol. 1. Stockholm: Lewis Publishers; 1994. Bakirci N, Sayiner A, Sacaklioglu F, Bayindir U. Across-shift lung function variation in cottonseed oil workers. Occup Med (Lond) 2006;56:365-70.